The first foal by Airdrie Stud & Gary and Mary West Stables’ stallion, American Freedom, is a filly born on Jan. 12 at Hillyard Stables in Corydon, Ky. Bred by Ashley and Josh Hillyard, the filly is out of the maiden mare One Minute, a speedy black-type daughter of Run Away and Hide. 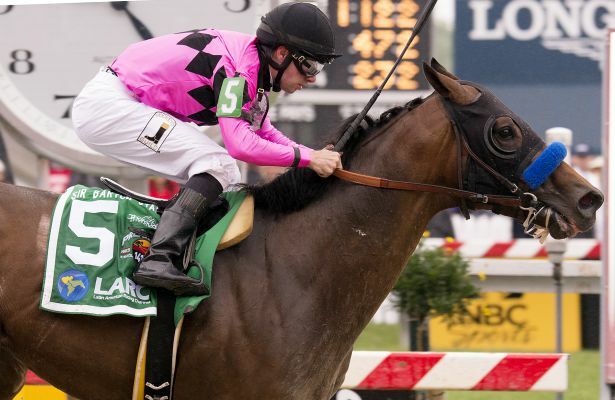 Trained by Ashley Hillyard’s father, John Hancock, One Minute ran out a 7 1/4-length winner of a Maiden Special Weight at Churchill Downs in May of her 2-year-old season, prior to placing in the Astoria Stakes at Belmont Park in her next start. One Minute, in turn, is the first foal out of the precocious multiple stakes-placed juvenile, Bach Hamilton, by Cherokee Run. “This is an absolutely beautiful filly. She’s got a lot of leg, a lot of length and all the substance you’d want. She acts like she’s got the athleticism as well because she jumped up in no time and knew just what the world was all about”, said John Hancock. American Freedom, a $500,000 yearling from the final crop of Pulpit, bred 152 mares in 2018, and is benefitting from the robust support of his owning partnership. Both Airdrie Stud and Gary & Mary West are breeding at least 20 mares to him in each of his first three breeding seasons. Trained by Bob Baffert, American Freedom was a multiple stakes winner of three of his first four starts, before posting gallant runner-up finishes in both the Haskell Invitational (G1) and Travers Stakes (G1). One of the best of his 3-year-old crop, American Freedom defeated each Classic winner - Nyquist, Exaggerator and Creator - and finished ahead of the mighty Gun Runner on both occasions they met. For more information about American Freedom, please contact Cormac Breathnach (859-552-4345) or visit www.airdriestud.com.